Strong, viable partnerships don't just happen. They need to be understood, properly developed and well maintained. Skills, knowledge and experience are required when we bring people together to form useful and productive partnerships. Many of us do not feel confident in each and every aspect of partnering or, if we do, we may not be able to share our knowledge effectively with others. The Partnership Handbook has been developed by the Labour Market Learning and Development Unit at Human Resources Development Canada to help people learn more about what community-based partnerships are and to offer suggestions about how to be effective in them. It provides tools and tips to enhance partnerships, and outlines what is needed to move forward together. 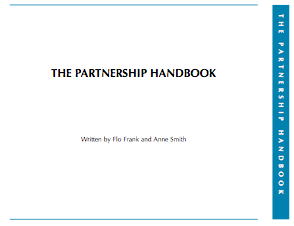 Section I of the Handbook defines what a partnership is and what it is not. Section II identifies the conditions that support partnerships and provides examples of assessment tools. Section III outlines the partnership process and how to apply it. Section IV explores the knowledge, attitudes and skills required to undertake a partnership. Section V examines common issues and concerns as well as providing some possible solutions. Section VI describes the characteristics of a variety of partnership approaches.